As I report, a spectacular fire is on-going in the Uptown section of Oakland, California. I am stunned that this fire is occurring. It sure looks like another lefty attack. The Oakland area is filled with private property haters. Left anarchists, socialists, anti-growth and anti-gentrification groups sit and plot on a daily basis, driven by the guiding words, "By any means necessary." Growth, increasing standards of living, businessmen, entrepreneurs and private property are their enemies. Fires of under construction buildings, that would improve the area, are common in the region. 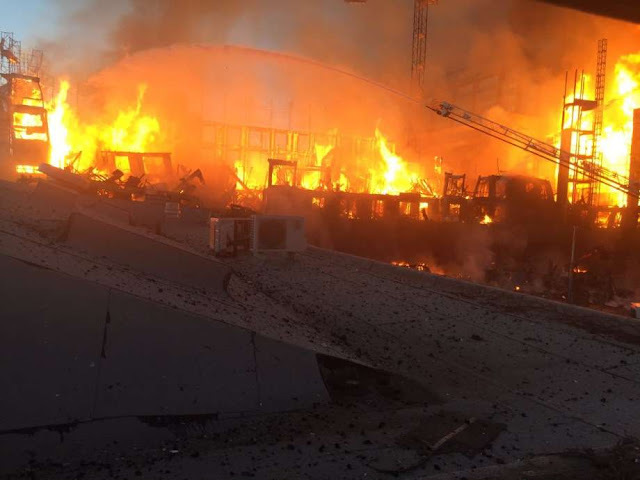 It’s the second time in three months that a fire has gutted a construction site in the East Bay. In May, a retail-apartment complex near the border of Oakland burned in a spectacular five-alarm blaze — the same building that was under construction again after it was destroyed in a massive, six-alarm fire last July! The current fire is at a location where a three-block, mixed-use development was under construction. 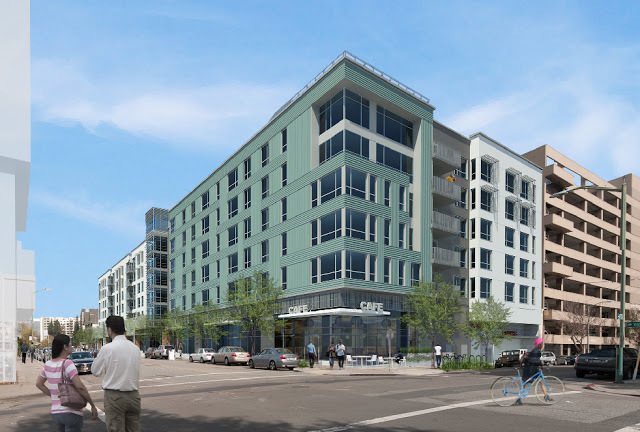 The project was planned to add 196 apartments as well as 31,000 square feet of ground floor retail. Wood Partners, a major national housing developer, is behind the project. Artist rendering of the planned project. How can you not protect such a multi-million dollar project with enough security to prevent lefty arson? There is a lesson here for everyone. There remain significant pockets of anti-private property elements in the United States and the world---and Oakland is an epicenter. Attacks will take place in different forms at different times. If you are an individual or a major developer, you need situational awareness. I have been known to wander, late at night, into areas where, let's just say, my situational awareness is high, but I am ready. It is just dumb for the developer to have not had proper protection for the property. Maybe now after three very suspicious fires (one already officially declared arson), developers in the area will wake up and protect their damn properties. The government is not going to do it. They will only appear on the scene to cool the embers. The development is likely insured. Real estate market-wise, a postponement for this project might not be the worst thing that could happen. After all, there can be situations where arsonist provide a net benefit to property owners. On a related note, insurance fraud is estimated to be the costliest of property crimes. One of the evil insurance companies will be footing the bill. I see them as being the ones adding security as they are ultimately responsible for paying for this claim unless they have some crazy arson exclusions. Why should the developers protect their property? Because it is their investment. They don't want to continue paying to simply restart the process again and again. They want to "build and lease" or "build and sell." Even if the developer is insured, the reason for their (the developers') existence is to make a profit, and they cannot make said profit until they have completed construction. Catch the leftist SJW turds who did this and set THEM on fire. To Hades with their "rights"
This strikes me as excessive. Robert, you've got some real dullards commenting today! Insurers don't ultimately pay out claims, insureds do. Nothing comes free. Go to the head of the class. It comes from this view promoted by some anarcho-capitalists that insurance companies are the savior for everything. The idea that insurance is magic is very prevalent. I couldn't tell you how many times I've had to explain to people how their mandatory insurance schemes are a scam because I must pay to insure all of my cars for liability 24/7 but I can only drive one at a time. I'm not sure that's a completely fair statement. First, if an insurance company goes after the perpetrator or his insurer (if any) and recovers its payout, then it won't raise the insured's future premiums (in a statist world I can see several impediments to insurers having a free hand to do this). Second, even if the insured's future premiums increase, they are likely to be less per year than the payout, and thus at a minimum the insurer is providing financing for the loss suffered by the insured. That's more in line with my experience.